Each month we will post new ideas for childrens craft activities and science projects that kids and adults can do together. These free childrens crafts and science activities should be fun for one or more kids as long as the adults plan to be involved too. The crafts supplies needed will be items commonly found in most households. It could be anything from an empty milk carton to a newspaper. Pipe Cleaners - ideas for making your own creations. Halloween Crafts - kids can make stuff to scare anyone this Halloween. Thanksgiving Crafts - crafts for the Thanksgiving Day. Kids Themes - lots of ideas and gift suggestions all about themes kids love (dinosaurs, space, nature, make believe, ...). Scroll down the page to find all the ideas in the craft and activity index list. Read the the Creative Kids Blog to find out our experiences crafts and activities or try Arncraft for creative projects using recycled materials. To find all the projects in the Free Kids Crafts and Science Activities Library, pick one of the categories on the right or scroll down the page to find the detailed lists of childrens craft projects and science activities. There are craft projects for holidays, ideas for a child's birthday party, science experiments, childrens games, and lots of family fun. You will find simple craft projects for young children, and ideas that will interest older kids. Some activities just take 10 or 15 minutes, others could take hours or days depending on your child's interest. Some of the craft projects can get a bit messy, but the kids love these ideas. If you don't want to do all the clean-up, let the kids know before you start that they will be participating in the clean-up too. Be sure to encourage your child's creativity. Try not to have expectations of how the finished art work should look. Often a child sees the world from a different point of view. Crafting together gives you a chance to see through your child's eyes. If you are working on a craft with a young child, try not to do identical craft projects. If your child is drawing a nature scene, maybe you could draw an apple. Children need time to develop their creative skills without being discouraged by comparisons to adult projects. Every parent must use their own judgment in choosing which crafts and activities are safe for their own children. While Creative Kids at Home makes every effort to provide activity ideas that are safe and fun for children it is your responsibility to choose the activities that are safe in your own home. Pick from the links above or scroll down this page to find lots of ideas for your and your children to have with childrens craft ideas and kids science projects. Kids Games - ideas for games for kids. You'll find everything from ideas for car games, to games for a group of kids. Crafts from Recycled Items - special projects that create art or toys from items that would have been thrown in the garbage. Pick from the free craft and activity links above to find lots of ideas for your and your children to have fun with childrens craft ideas and kids science projects. Halloween Customs - new ideas for celebrating on October 31. Christmas Crafts - ideas for ornaments, decorations and gifts made by children. Christmas Customs - what is the story behind our Christmas customs? Valentine's Projects - Gifts and crafts to celebrate St. Valentine's Day. Easter Crafts - ideas for crafts and activities to celebrate Easter. Mother's Day - how did it start and gift ideas kids can make. Father's Day - how it began and gift ideas kids can make. Fancy Napkins - Have your kids craft the table decorations. Birthday Parties - Ideas for Planning Children's Birthday Parties. Birthday Party Themes - How to pick a theme and themes from kids birthday parties. Birthday Party Plans - games and activities for children's birthday parties. Kids Themes - lots of ideas all about themes kids love. Butterflies - raising Painted Lady Butterfly caterpillars. Hot Air - Find out more about air pressure and hot air. Sunlight - learn about the sun's rays. Easter Eggs - kids will love these ideas for decorating Easter Eggs. Christmas Cookies - use cookie cutters to make them your favorite shapes. Cup Cake Cones - Too cold for ice cream? Give the kids these cupcake cones! Pumpkin Seeds - recipe for this delicious Halloween treat. Playdough - Children love homemade playdough. Finger Paint - You can make just about anything! Alphabet Letters and Word book - great for young children to first learn letters. Animals - make your own paper animals with this childrens craft. Bookmark - this gift will mark a special place in your heart. Bubbles - recipes for kids who love blowing bubbles. Bubble Wands - ideas to make your own bubble wands. Bubble Rope - with these wands, anyone can blow a rope of bubbles. Color and Bubbles - great activity to keep children busy while you are working in the kitchen. Rainbow Bubbles - see the light reflect into rainbows of bubbles. Butterflies from paper - kids crafts to make paper butterflies. Butterflies from coffee filters - kids crafts to make beautiful butterflies. Handprint Butterflies - butterflies from children's handprints. Caterpillar tree - learn about the lifecycle of the butterfly while making a craft. Flash Cards - make your own educational flash cards. Mixing Colors - quick and easy idea for children to play with color. No Mess Fun - great activity and clean-up is easy! Peekaboo Box - craft project for all those 'treasures'. Pipe Cleaner Creatures - easy craft for younger children. Sandbox Fun - ideas for sandboxes and sidewalk chalk. Shapes Box - easy to make and educational too! Snowflakes - younger kids will love these glittery snowflakes. Sparkle Snowflakes - make pipe cleaner snowflakes that sparkle. Inuksuk - You've seen it, but can you make it? Journal - Introduce kids to the joys of journaling. Balls - make your own juggling balls or bouncy balls. Crystal Snowflakes - beautiful decorations for your windows. Miniature Golf -Why wait for a sunny day, kids can create an indoor golf course. Painted Fabric - Paint your own clothes or make gifts for family. Paper Plate Skeleton - make a life size skeleton. Paper Stars - make these fold-up stars from fancy papers. Sculpey - fun with modeling polymer clay. Soaps and Bath Salts - Learn how to make your own. Snow Fort - build your own snow fort or castle. Teacher's Gift - Gift ideas your child can make for their teacher. Teacher's Gifts to buy - gift ideas you can buy as a class or from one child. Beads - Childrens crafts using leftover beads. Beeswax Candles - easy to make and they smell delicious! Balloon People - make a whole family. Bouquet of Hearts - make a heart bouquet for Mom! Building Blocks - Finally, a use for all those meat trays you've been saving! Colors - Kids can learn about colors with this craft. Comets - fun craft to make and fun to play with! Community Mailboxes - Great for large families, daycares, or group homes. Decorative Napkin Rings - Kids can make table decorations. Dynamite Domes - Amazing what kids can build from some old newspapers! Fortune Teller - keeps kids busy with one sheet of paper. Fridge Magnets - Create your own fridge decorations! Fossils - How old are those fossils? For the Birds - crafts ideas for our feathered friends! Hairy Heads and Egg Heads - Kids love to watch things grow! Horseshoe Game - Kids can make their own. Jar Lids - What can your kids make from juice lids? Jiggle Dough - kids love to watch it jiggle. Mandalas - Coloring pages based on Tibetan Art. Marbles - make your own marble game. Marshmallow Snowflakes - make snowflakes from marshmallows. Paper Mache - directions for paper mache pi�atas and masks. Paper Mache tree - directions for paper mache tree. Paper Snowflakes - Fun ideas for making all kinds of snowflakes. Paper Flowers - make a bouquet of flowers. Paper Hearts - woven paper baskets in a heart shape. Party Hats - make your own paper, party hats. Pi�ata - simple idea to make a pi�ata. Planets - make a mobile from our solar system. Picture Frame - kids can use old puzzle pieces to make a picture frame. Rain Sticks - They really sound like a rainfall. Reuse your pictures - what to do with cards, calendars, and magazines. Rocks - Create your own pet rock. Sand Projects - things to make at the beach. Sand Footprints - create memories of walking on a beach. Silly Slime - children love the ooey, gooey fun. Spider Webs - make your own Halloween decoration. Stain Glass Windows - use old crayons to make window decorations. Tie Snake - make a snake from an old tie. Scavenger Hunts - Kids love hunting for anything. Spa Flowers- flowers from bath sponges to decorate gift baskets. Treasure Hunt - how to plan a treasure hunt. Jelly Treasure hunt - gooey, sticky and lot of fun. Treasure Maps - how to make a treasure map that looks 100s of years old. Water Balloon - fun game for a summer afternoon. Water Chimes - Music from water, incredible. Window Decorations - Kids can have fun painting Christmas designs on the window. Woven Baskets - easy to make, and a nice gift idea. Here's some comments about our free crafts and activity ideas from our visitors. 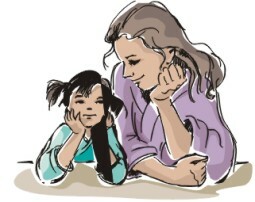 Thanks for your creative website, it is really helpful for us mothers with little time for our kids. We can teach them this activity so they will not engage themselves to an all day tv viewing and it will made them be creative too. hope to see a lot more. More power to you! I love your website. It's the best. Especially with arts and crafts for the kids. I have my own daycare and I get a lot of activities from your website. The kids absolutely love it. Thanks for your time. Your web site is great so many choices. My favorite is the tissue paper one!!!! 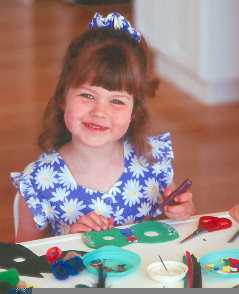 If you have fun with one of our childrens crafts or kids activities, tell us about it. We'd love to hear all about your kids crafts activities. Send us a note if you have any questions, or would like to share your idea for childrens activities with our visitors. Check back each month for more free ideas for childrens activities, kids crafts projects and kids science projects.